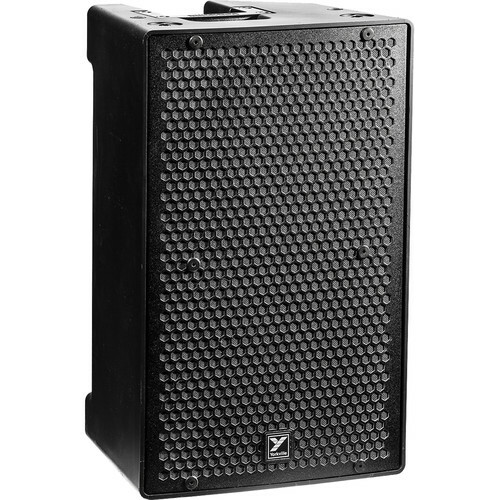 The rugged yet lightweight ABS PS10P 10" Parasource Powered Loudspeaker from Yorkville Sound is designed to be a Front-of House cabinet, side fill cabinet or floor monitor. The PS10P provides an integrated 800W amplifier and uses a 10" woofer, with a 2" voice coil to deliver low end punch from as small a physical cabinet volume as possible. Wide 90° x 70° (H x V) conical horn delivers improved constant directivity. Multi-band limiting allows the cabinet to deliver maximum output. Integrated DSP enables the PS10P to operate in any application without complex external processing. A simple one-button high pass filter switch rolls off low frequency material when PS10P is used with any Paraline Series or powered élite System subwoofer. Bass boost delivers improved bottom end response from the PS10P without cluttering midrange program or affecting the cabinet's overall. The cabinet features a passive cooling scheme, allowing the PS10P to operate without need of noisy internal dust collecting fans. Integrated reinforced flypoints enables the PS10P to be transported quickly and easily in any fixed installation.